Speaking after the reading of Megillat Esther (the Scroll of Esther) in honor of Purim Thursday night, Prime Minister Binyamin Netanyahu said that he was thankful to Israelis and world Jewry “for their support of my speeches in Washington. The days that Jews were unable to defend themselves against threats and they remained silent as their enemies attempted to destroy them are over and will not return. The State of Israel will do everything necessary to defend Jews,” Netanyahu said. 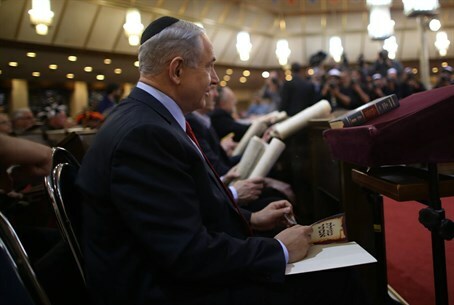 Netanyahu attended the megillah reading in the Great Synagogue of Jerusalem, along with Jerusalem Mayor Nir Barkat and hundreds of congregants. If the Jews survived his regime, Hitler is said to have quipped, “they will celebrate a second Purim,” Netanyahu said. “The Nazis were beaten but the Jews did not celebrate, because they managed to destroy a third of our people. There was no king to give us license to defend ourselves, and even if there had been we would not have had the resources to do so. “Now, with the new threats against us today, we have two lessons to learn from Purim,” Netanyahu said. “We must speak up and scream out against all the dangers facing us before it is too late. That is what I did in Washington. I called on the US and its allies not to sign on the bad deal that is developing with Iran that will be a danger to Israel, the region, and the whole world.